The Pinacoteca Giovanni e Marella Agnelli presents the Draftsmen’s Congress, created by Polish artist Paweł Althamer. 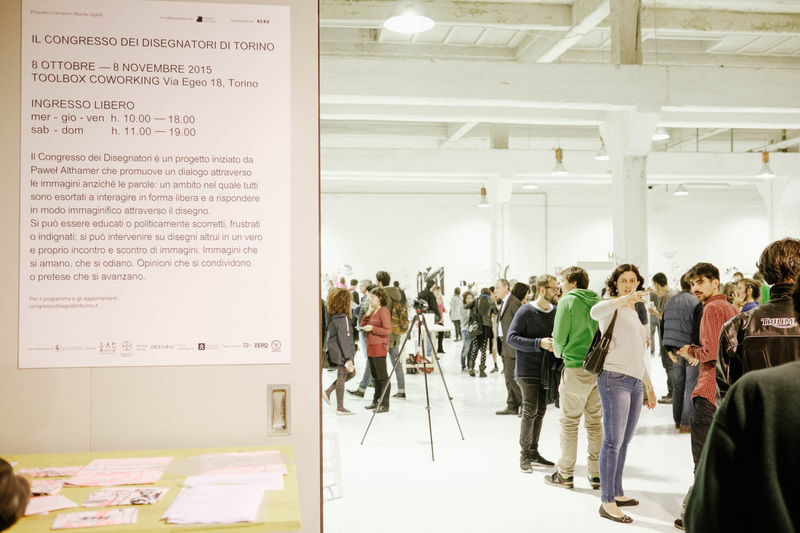 The project, curated by NERO and realized in collaboration with the Istituto Svizzero di Roma, will be held in Turin from 8th October to 7th November in Toolbox Coworking. The Draftsmen’s Congress is a place open to everyone, where people are invited to draw freely on the walls, using paint, charcoal, collage or employing other techniques and materials. The project promotes a dialogue made of images instead of words: an environment where everybody is encouraged to interact in a free way and answer imaginatively through drawing. They may be polite or politically incorrect, frustrated or outraged; they can intervene on drawings by others in a true encounter and clash of images. Images they love, they hate, opinions they share or claims they stake. The Draftsmen’s Congress in Turin will take place at Toolbox Coworking, a space devoted to co-­‐ working, obtained from two former industrial buildings behind Porta Nuova Train Station, a place where one can exchange job opportunities, competences and services, where self-­‐ employment is redesigned in a social way, focusing on relational skills and shared knowledge. Toolbox walls are the space where participants will be able to express themselves freely: 700 sq. m. where artists, illustrators, street artists, architects, designers, musicians, craftsmen, self-employed, unemployed, pensioners, students will be able to draw, openly exchanging views on sharing and creation, on authority and the hierarchies defining competences and any kind of qualification in professions. Throughout the duration of the Draftsmen’s Congress in Turin, the Educational Department of the Pinacoteca Giovanni e Marella Agnelli shall engage schools and associations in activities aimed at youths, where they can measure themselves against art and creativity with an original and inclusive approach. Talks with artists will be organised alongside concerts and workshops to suggest topics and host the social and cultural experiences of the city of Turin. On 8th October for the opening of the Draftsmen’s Congress, Italian, Swiss and European artists will meet the public and artist Paweł Althamer to start a creative process which will end on 7th November with the closing event Fluo Night. Started in 2012 in Berlin in St. Elizabeth’s deconsecrated church, in Rome at the Istituto Svizzero di Roma and at ESC Atelier Autogestito, within the Solidarity Actions of 7. Berlin Biennale, the Draftsmen’s Congress has been organised in different cities around the world and in different venues, cultural associations, disused industrial estates, artist’s studios, museum institutions of ancient (National Art Museum of Ukraine, Kiev) and contemporary art (New Museum, NY, UCCA, Beijing). Sponsor: Amici Pinacoteca Agnelli, Bayer.